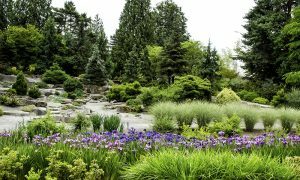 Bellevue Botanical Garden is made up of many gardens to delight and educate our visitors. 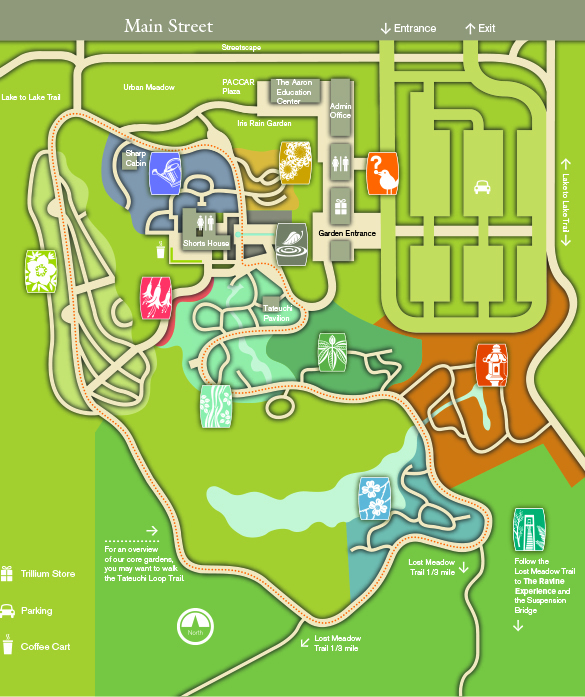 Explore the map to plan your visit and choose from the gardens below to learn more about what you will find there. Some of summer’s most dazzling floral displays welcome you in this garden, cultivated by the Eastside Fuchsia Society since 1992. The breadth of fuchsia selections that can be grown in the Northwest is astounding. In any given year, there are about 100 different kinds of fuchsias on display, and most of them are winter-hardy in the Pacific Northwest. To the delight of many visitors, hummingbirds attend to the fuchsia blossoms throughout the summer. Stroll a 1/3-mile loop trail through 10 acres of woodlands, meadows, and wetlands that are being restored and enhanced to create native plant communities. See how active forest management can create a refuge for people, plants, and wildlife. 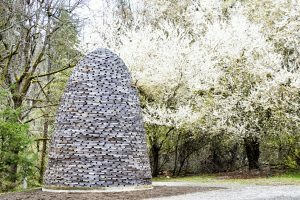 Be sure to stop and see Night Blooming (pictured here), a sculpture on the Lost Meadow Trail. This sculpture is the work of Taiji Miyasaka and David Drake. 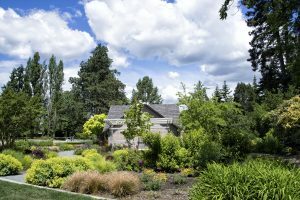 The Native Discovery Garden, maintained by the East Lake Washington District of Garden Clubs and the Washington Native Plant Society, inspires visitors to look to the native plant palette when planning their home gardens. Adapted to the climate and conditions of the Pacific Northwest, native plants in urban landscapes can be ecologically sound, beautiful, and low maintenance. Adjacent to a natural wetland, this garden illustrates the many layers of plant life in the Northwest, from ground covers to trees. It serves as a transition from the gardens to the woodlands and forested lands to the south. Sculptor David Maritz created “Owl’s Glare,” a bronze owl in flight, which graces the central bed in the Native Discovery Garden. This amazing perennial border is a showcase for what works best in Northwest gardens. Come revel in thousands of perennials, shrubs, bulbs, evergreens and trees that provide color and beauty year-round. Stroll the paths, relax on the benches, and enjoy the largest public perennial garden in the country maintained entirely by volunteers. The Northwest Perennial Alliance created and maintains this award-winning garden. 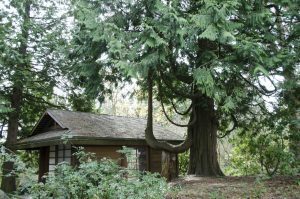 It is a source of education and hands-on learning opportunities for NPA members, horticulture students and gardeners throughout the Puget Sound area. Volunteering a few hours in the Border is the ideal way to expand your knowledge about gardening while giving back to the community. You usually find our volunteers in the Border at 10 a.m. on Thursdays. You’re welcome to join us! Email us if you’re interested in helping. This second-growth forest edge reflects the legacy of the original Shorts garden. 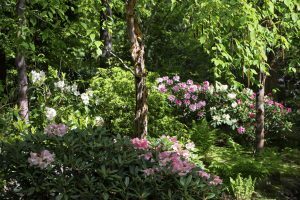 Over 50 different rhododendrons and their companions are included to demonstrate their use in the landscape. While the rhododendrons are in full bloom through spring and early summer, summer-blooming hydrangeas, brilliant fall color of specimen deciduous trees, and the winter-blooming Edgeworthia chrysantha provide year-round interest. 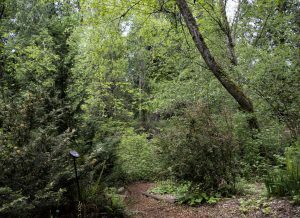 In the 1990’s, Harriet and Cal Shorts, enthusiastic members of the Hardy Fern Foundation, donated $25,000 to create a fern collection at Bellevue Botanical Garden. 750 ferns are now planted in the garden associated with the Rhododendron Glen. Ferns here are intended to introduce the public to a variety of ferns suitable for Pacific Northwest gardens. The Hardy Fern Foundation maintains this premier collection of fern taxa. Tiny wildflowers, mountain hemlock, and granite outcrops introduce you to a special world of plant life and land forms. Once established, rock gardens need less attention than almost any other type of garden. The plants are well adapted to our climate. Weeding, occasional watering and annual mulching are the only maintenance requirements. At the base of the Rock Garden lies the Iris Rain Garden. Surface water is filtered through the Iris Rain Garden before making its way into our streams and lakes. The Rock Garden is maintained by the Northwestern Chapter of the North American Rock Garden Society. Take in the sights and sounds of water cascading through a lush display of ground covers. Plantings stretch out under the shade of maples and along the banks of a re-created mountain stream. The Atsuhiko and Ina Goodwin Tateuchi Foundation funded the design and construction of a viewing pavilion, Ground Cover Garden terrace, and bridge. 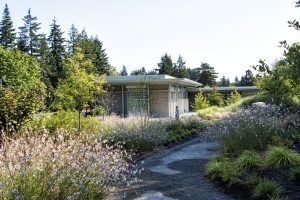 Designed by Robert Hoshide of the firm Hoshide-Williams Architects, with input from the Bellevue Parks Department and the Bellevue Botanical Garden Society, the pavilion and terrace use elements of Northwest and Asian architectural styles. The Pavilion has commanding views to the Ground Cover Garden and Rhododendron Glen. Enjoy the view from the Tateuchi Pavilion, made possible through the generosity of the Atsuhiko and Ina Goodwin Tateuchi Foundation. This tranquil space features the Garden’s symbolic source of water emerging from stone and flowing through a rill to spill over the east edge of the patio. The rill was funded by a grant from the Stanley Smith Horticultural Trust, and was the first major grant the Society received. 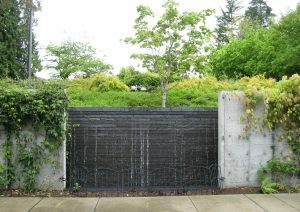 In 2013, the Seattle Garden Club’s generous support funded the surrounding garden, which includes an informal hedge that provides year-round interest in a low-maintenance garden. 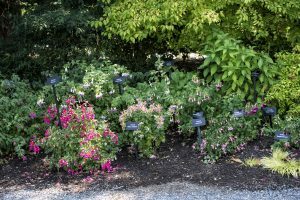 In keeping with our collections policy, Great Plant Picks are well represented by a mix of deciduous and evergreen plants to provide an ever-changing tapestry of color, texture and fragrance throughout the year. From the entry courtyard, an easy and relaxing stroll along this loop trail leads to the Tateuchi Pavilion, the Shorts House, and core gardens. Enjoy the view from the Tateuchi Pavilion (pictured here), made possible through the generosity of the Atsuhiko and Ina Goodwin Tateuchi Foundation. Take a Walk on the Wild Side! 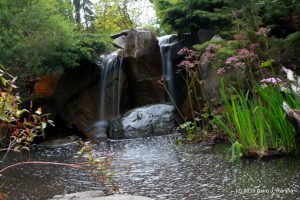 An exciting feature lies in the heart of the forest at the Bellevue Botanical Garden. A 1/3 mile nature trail crosses a deep ravine into the most pristine of our wild spaces. 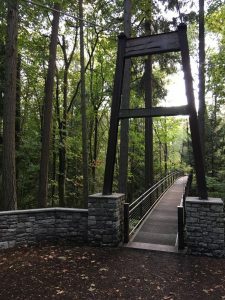 A 150-foot suspension bridge spanning the ravine allows visitors to observe unique topography, native understory, wildlife, and soaring conifers without disturbing the forest floor. Featured in our original master plan, the project was revised during the 2008 master plan update. Construction began in September 2011 and the Ravine Experience opened to the public in spring 2012. The project was made possible through a combination of private donations, 2008 Parks and Open Space Levy funding, and a grant from the PJA Foundation. The Urban Meadow, our newest garden, features a beautiful, naturalistic design with large swaths of grasses and perennials that bring year-round interest to the front garden. The Meadow is designed to use less water and fewer chemicals, and highlights native plants, many of which attract pollinators, such as the colorful Salvia nemerosa ‘Caradonna’. The Meadow also features a Mason Bee exhibit, as well as several tribute benches. The Urban Meadow was made possible, in part, by a generous grant from the King Conservation District. Discover an alluring landscape that is healthier for families and local eco-systems. The Waterwise Garden showcases a diverse array of plants that delight the senses, attract native wildlife, and conserve resources. 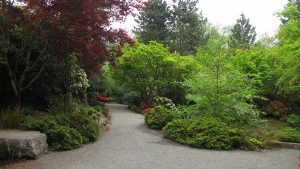 A visit to its shady pathways confirms that splendid gardens don’t require large amounts of water or garden chemicals that can harm children, pets, and the Puget Sound. This award-winning display offers rich possibilities for your home garden and a healthier environment. In the Waterwise Garden, you’ll learn new practices and discover plantings that conserve water, lower chemical use, reduce runoff, recycle waste, and preserve habitat – all without sacrificing an ounce of beauty. 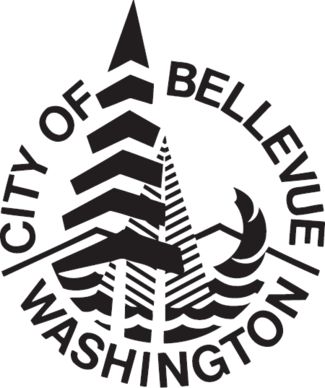 Bellevue Utilities sponsors the Waterwise and its Natural Gardening Resources . For information about the plants, see the Garden’s Collection Search. A traditional Japanese gate leads into this contemplative garden. Developed to honor the sister city relationship between Bellevue and Yao Japan, the garden is a blend of Pacific Rim influences: delicate maples beside Columbia River basalt; ground covers surround Japanese lanterns; vibrant azaleas accent rhododendrons and viburnums. 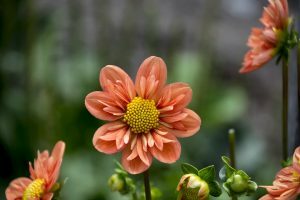 The annual Dahlia Display has been planted and maintained by the Puget Sound Dahlia Association since 1993. Sun-loving dahlias provide a kaleidoscope of color and texture from high summer through fall. The tubers are dug and stored every October; old favorites and exciting new cultivars are planted each spring.